Chinese energy giant CNOOC Group is studying the possibility of building a multibillion-dollar floating liquefied natural gas (FLNG) vessel, as-yet untried technology that would likely be used to produce gas from the deep waters of the South China Sea. While the state-run company has made no public announcement, a pre-feasibility study was well under way, CNOOC and other industry officials said. CNOOC was already talking to global engineering firms about possible joint design of the vessel, two industry officials added. FLNG ships are ocean-based liquefaction plants that can be positioned above reserves to chill extracted gas and load it into LNG tankers for delivery. That could make fields too remote or too small to develop using undersea pipelines viable for production. 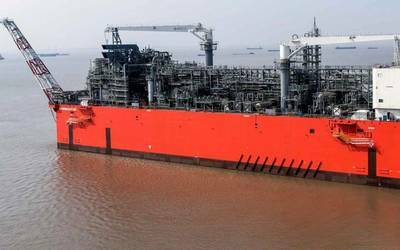 About 10 FLNG facilities are being planned globally with a handful under construction, among them the biggest, Prelude, owned by Royal Dutch Shell and due to be producing from an offshore Australian field by 2017. Shell has shied away from offering estimates of Prelude's likely cost, but analysts say it could be more than $12 billion. While a Chinese FLNG plant might be some years away, industry officials said such vessels could become an important component of Beijing's strategy in the South China Sea - including in disputed waters - as the country looks to boost its offshore energy output. CNOOC Group also owns a $1 billion oil rig that was deployed by state-run China National Petroleum Corporation (CNPC) to drill in waters claimed by Vietnam in early May. On Wednesday, CNPC said the rig had finished exploration after finding signs of oil and gas near the Paracel Islands. CNOOC Group was doing a pre-feasibility study to evaluate the potential costs and returns of using FLNG technology, the firm's chief deepwater researcher, Xie Bin, told a seminar last month. In the energy sector, a pre-feasibility study comes first and is usually followed by more detailed research and design, which could involve outside experts and a bigger budget. "For disputed waters, we need to be self-sufficient because we can't expect onshore support from any neighbouring nations," Xie said in the Chinese city of Tianjin. Approached later at the seminar by Reuters, Xie declined to make additional comments. He gave no cost estimate for building an FLNG facility, although other industry officials said it could run to several billions of dollars. CNOOC Group, parent of the flagship listed unit CNOOC Ltd , told Reuters on Tuesday that research into FLNG technology was under way but declined to say more. The group has long said it wanted to conduct more exploration in deeper waters off China, having in 2010 set a goal to find by 2020 another "Daqing" - an onshore field in the country's northeast that produces one million barrels per day of oil equivalent. China has so far made only one major gas find in the deep waters of the South China Sea, the Liwan 3-1 field in undisputed Chinese territory off Hong Kong. The field is being developed by CNOOC and Canada's Husky Energy. 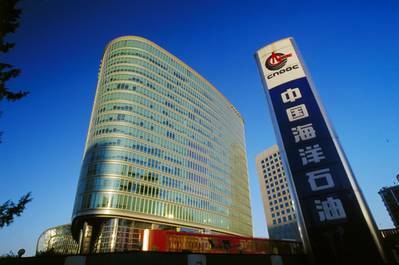 Xie said CNOOC was looking at an FLNG plant that could handle up to 2.4 million tonnes of gas per year (tpy) and operate at a depth of 1,500 metres (4,900 feet). Other industry sources said it might start with a smaller 1 million tpy vessel. Prelude by comparison will produce about 3.6 million tpy - still small versus some land-based LNG plants. In April, an in-house article on CNOOC Group's website said its research and development arm together with two Chinese universities had designed a small-scale FLNG vessel with a capacity of about 5,000 tpy. The company planned to build the model by the end of September and test it off the northeastern port city of Yingkou, the article said. CNOOC Group is also courting foreign firms about possible joint design of an FLNG ship, said Li Jianmin, head of the deepwater engineering department at CNOOC Ltd, and Feng Qin, chief specialist for offshore engineering at Asia's top oil refiner Sinopec Corp. Both Li and Feng declined to name potential partners. They spoke to Reuters last week. Feng said he was aware of CNOOC's study as well as plans by other Chinese energy firms to research FLNG technology. While Feng would not say if Sinopec was interested in FLNG, he said it was a promising option for the South China Sea. "FLNG has an unrivalled advantage for relatively small-scale deepwater gas fields versus subsea pipelines," Feng said. In disputed waters, a single vessel would also be much easier to protect than potentially hundreds of kilometres of pipeline. Wang Jinlian, secretary-general of the China Association of the National Shipbuilding Industry, told Reuters the government was ready to finance research and development and offer tax incentives for any local manufacturing work needed to build such floating liquefaction plants. Government officials could not be reached for comment, but the Ministry of Finance issued a policy document in April supporting local companies developing offshore engineering technology through tax incentives and the waiving of import tariffs on components and raw materials.